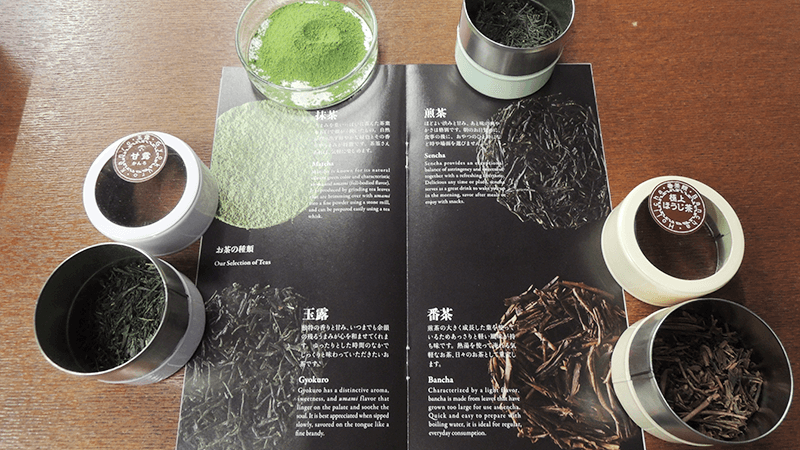 “Ippodo Tea Co.”, a Japanese green tea specialty store, sells Matcha, Gyokuro, Sencha, and Bancha. With the store history going back nearly 290 years, the high quality of the products goes without saying, and it is also recommended for those who are not familiar with Japanese green tea. You can let the staff know the tea flavor that suits your taste, and they will be more than happy to help you in a kind manner. The staff can speak simple everyday English and several informational leaflets are also available in English. Tea tools and kits are also available, which make drinking Japanese green tea easy and enjoyable. In addition, you can prepare your own tea at a café adjacent to the tea store. Come and visit “Ippodo”, and you will love and want to know more about Japanese green tea. Enjoy the distinctive Umami flavor and sweetness of Gyokuro, which will linger in your mouth. The ones with a light flavor go well with meals. Matcha sweetened with granulated sugar. Those who are not keen on the bitterness of Matcha will enjoy this item. Packaged in individual stick packs, it is highly convenient and portable. Making Matcha has never been easier with this kit. It includes all the tools you need to prepare Matcha. It comes with an English manual and is perfect for souvenirs. There is a wide variety of teas available. If you are not familiar with tea, it is recommended that you talk to the staff members about your budget, preference, and purpose, and they will be more than happy to help you select a tea that suits your taste. They will also let you smell the aromas of different teas. You can purchase online through Ippodo’s website. The website is also available in English. Ippodo has a branch in New York. The popular item is Matcha Soy Latte. You can experience and appreciate the fact that Japanese green tea is such a profound drink! They have many foreign visitors, so the staff members are used to communicating in foreign languages. Sets of tea and tea tools are recommended as souvenirs and gifts! 5-minute walk from Subway Tozai Line Kyoto Shiyakusho-mae Station.10-minute walk from Subway Karasuma Line Marutamachi Station. If you are unsure of which item to choose or have any questions, it is recommended that you ask staff members for help. Prices vary as tea is sold by the gram. The staff can speak simple everyday English and several informational leaflets are also available in English.